The Freedom Fighters of China are invading The Bund - a tourist area along the Huangpu River in Shanghai. Led by Human Firecracker, the FFC prepares to wreak havoc using the stolen Genetically Modified Starros. Flying Dragon General prepares tea and requests that Kenan take a seat. Kenan asks his father why he became Flying Dragon General. Zhongdan explains to his son that many years ago, his brother Zhonglun was an activist. Zhongdan became infatuated with activist Kuang Meitai. Zhongdan decided to join the cause in order to woo Meitai. Meitei gets wise to Zhongdan's plan, who has since come to believe in the cause. One day a protest of theirs was met with government force. Zhongdan suffers a concussion and wakes to find Meitai watching over him. The eventually decide to leave the cause to start a family. Zhongdan and Zhonglun were out of touch for twelve years until the day the Justice League made their presence known. Meitai makes a decision to be like the American heroes and fight for freedom as Liberty Goddess, China's first superhero. Two months later, she died in a plane crash. Zhongdan discovered the crash was no accident, and was caused by The Ministry of Self-Reliance. Baixi is attempting to contact Kenan. 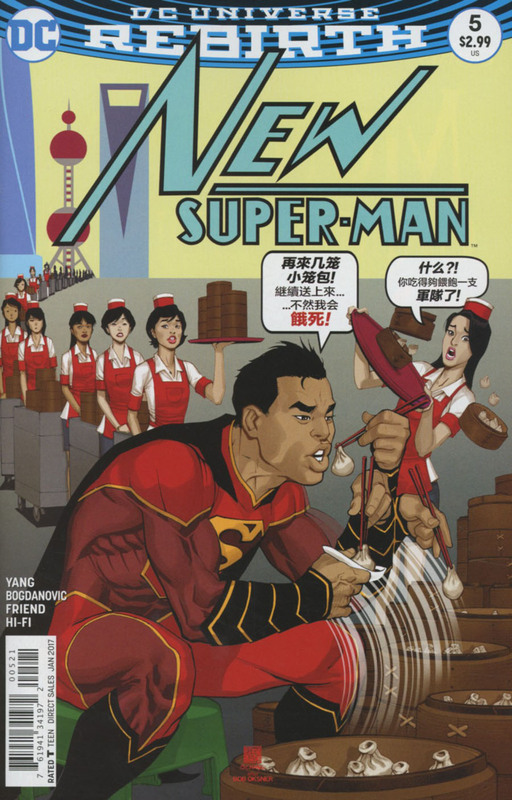 The Justice League of China is required to assist in an emergency. Zhongdan continues to explain that after the death of his wife, he and his brother formed the Freedom Fighters of China. Zhongdan attempts to recruit his son. Baixi continues trying to communicate with Kenan before using technology to turn on the television in the living room. A news broadcast reports on the fight between the Freedom Fighters and law enforcement. Zhongdan and Kenan leave to join the fight, leaving Baixi and Deilan questioning where Flying Dragon General came from. Before Wonder-Woman and Bat-Man can leave, a paper airplane destroys the B.U.V. 's tech. At the Oriental Pearl Tower, August General in Iron informs Dr. Omen that he'll be sending in The Great Ten to take care of the situation. At The Bund, the fight rages on as Super-Man and Flying Dragon General arrive. As Super-Man is introduced as a newfound ally, several probes detonate, catching the team off-guard. 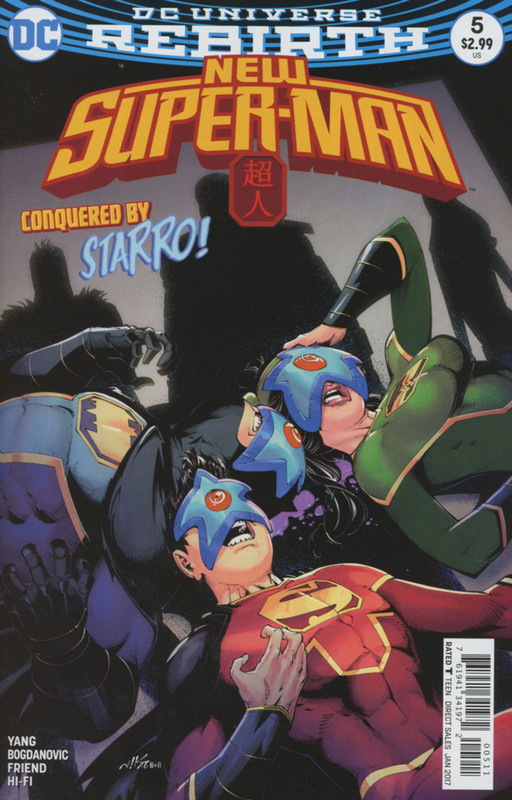 Bat-Man and Wonder-Woman are prepared to fight, but Human Firecracker throws two Starros their way. Firecracker now has control of their minds. Zhongdan confronts his brother. Using mind control to achieve democracy is just as bad using government force. Kenan demands Firecracker release his friends and is attacked by the FFC. Super-Man's powers disappear. His hands are bound, and he is knocked into the water, doomed to drown. Zhongdan rescues his son and pleads with Dr. Omen to help save his son. Elsewhere, a plane filled with people controlled by Starros is about to take off. Kenan recovers. It appears his powers come and go when he gets overly emotional. Dr. Omen puts a restraining device on Zhongdan. When the mission is complete, he will surrender, or she will explode his heart. Zhongdan and Kenan race off to save China. Story - 4: I enjoyed this issue. Yang gives some backstory to Kenan's father, and it's certainly welcome. Up until this point, he was just a background character that happened to also be a villain. With this issue, the reader is given the opportunity to sympathize with him. Zhongdan clearly cares about his son, and has a definite sense of right and wrong, as evidenced by his decision to work with The Ministry of Self-Reliance. The action is top-notch, and the inclusion of the Genetically Modified Starros is interesting. I find myself increasingly excited to read this book. My only complaint is that Kenan does quite a bit of flip-flopping in this book. One minute, he's against his father and the Freedom Fighters, then he's fighting with them. Not five pages later, he's against them again. It isn't too distracting, and it probably speaks more to his ignorance of the situation at hand, but I figured it was worth a mention. Art - 5: Bogdanovic still knocks it out of the park on this title. The flashback scenes are well-drawn, and quite beautiful to look at. Action scenes continue to be visually interesting. Bogdanovic also gets points for drawing a great Action Comics #1 reference. Cover Art - 4: The standard cover works just fine. I only wish the background were a little more colorful. The shadows are alright, but grey isn't the strongest color to use for the backdrop. Variant Cover Art - 5: I'm a sucker for tribute covers. The variant is a neat little tribute to Action Comics #454. There's not much else to say. I just find myself enjoying it.